These weeks are just flying by – how did I get to 18 already?! I feel more and more pregnant every day. I’m out of breath after walking up the stairs at work (I was huffin and puffin a little before but now it feels like I ran a marathon once I get to the third floor). Smells are driving me insane…like the leftover minestrone soup I just had. It tastes good but the smell makes me queasy. And I’m filling my maternity shirts out more. I felt like I did an abs workout the other day (which I definitely did not! ), so I’m assuming I’m going to really pop any day now. On another note, I ordered some more books from Amazon.com relating to pregnancy/baby, so I’m slowly reading through them. 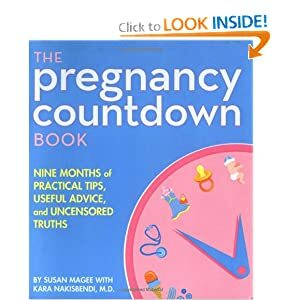 The one I love the most so far is The Pregnancy Countdown Book. I’ve caught myself up to Week 18, so I can’t review the entire book yet but so far it’s great. First, I LOVE countdowns. Second, this book is FUNNY. It’s down to earth, includes some medical info but keeps it short and to the point, and includes real-mom advice. The part that has struck me the most so far is the fact that you’re always “waiting” during your pregnancy. Waiting for the first positive pregnancy test, waiting for the first appointment, waiting to hear the first heartbeat, see the first ultrasound, feel the first kick, etc, etc. It’s so true! It’s not a long book - I actually wish each “chapter” contained some more info. Baby is the size of a: Sweet potato…mmmm love sweet potatoes! Symptoms: Achy. Belly stretching and back aches, but nothing too uncomfortable. Anything Making Me Queasy or Sick: Leftovers…yuck. I can eat them but the smell is blehhh. Sleep: Not bad…I actually slept through one whole night without having to get up to pee!!! What I miss: Nothing in particular. Movement: More pokes…hard to tell if they’re kicks, though. It’s not constant yet, either. Maternity Clothes: Wearing more and more of the maternity wardrobe…I’ve tried wearing non-maternity sweaters/shirts but some are too short and not flattering. And it’s a good thing I use the treadmill at home because my work tank-tops will not be covering the belly soon. Besides, I figure I might as well get my money’s worth with the new clothes I bought! Best Moment of the Week: Feeling more pokes…it freaks me out when I’m sitting at my desk but I love it. What I’m excited about/looking forward to: February 3rd! You look so adorable! I completely know what you mean about the waiting, and it is all waiting! Each week when I'm a week farther along than the week before (obviously) I'm waiting for the next week to say I'm __ weeks pregnant! I try to enjoy each day for it's own, but it's so hard!